We just had to try this: it’s recommended all over guide books. It’s not cheap, but we used our “origin: developing country” to beg for a cheap-cheap price. It always work! 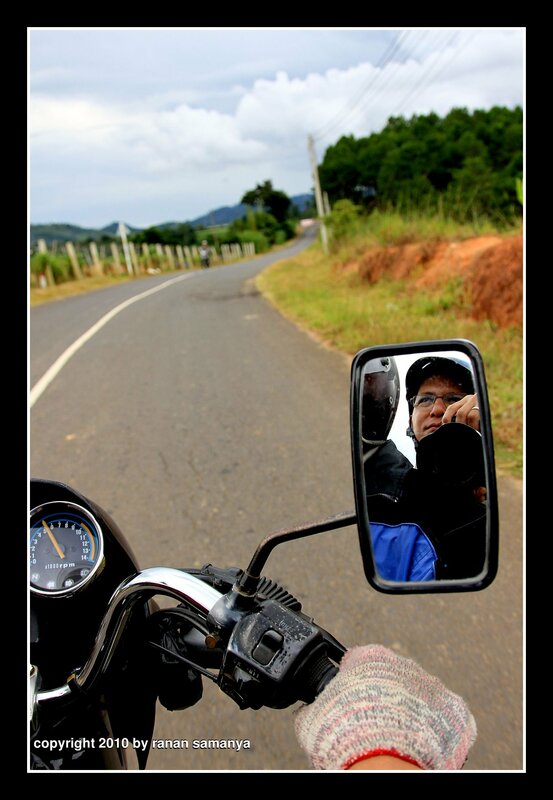 Dalat easy riders are tailor-made motorcycle tour well known in Đà Lạt, Vietnam. The gang is easily recognized by their blue jackets and the easyrider logo on it. most motorcycles are 250cc class. Don’t worry about safety. They are very gentle on the road. Their motorcycles are equipped with raincoats for both us and our bags (if any). Tours can last from 1 day to more than 1 week. We were first thinking to go from Dalat to Danang using them with several stopovers along the road, but since it will take 5 days we opted for just a day tour with two bikes. The morning was bright and very fresh. The fresh air lingered even though we were on the bikes, as Dalat is around 1,500m above the sea level. The journey included visits to a few home industries producing wine and mushrooms, and a few plantation (tea, coffee and flowers). But even without all the extra sites, the ride across the countryside with such a fine weather was very much enjoyable. And in case you ask, yes, it included a huge lunch over a local restaurant which serves superlicious pork!